Two Columbia College-Kansas City faculty members are published authors. 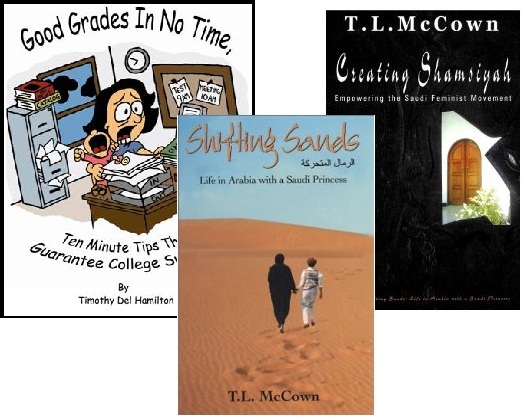 Tim Hamilton, a business instructor, has published “Good Grades in No Time: 10 Minute Tips that Guarantee College Success.” Communications instructor Dee Mathison published two books, “Shifting Sands: Life in Arabia with a Saudi Princess,” and “Creating Shamsiyah: Empowering the Saudi Feminist Movement,” under the pseudonym T. L. McCown. “Good Grades in No Time” is designed for adult students looking for some quick methods to improve their grades. The book is a great resource for college students or as a gift for a friend or family member returning to college. Hamilton originally made the book available as an ebook on both Kindle and Nook, and hardcopies are now available from Barnes & Noble. “Shifting Sands” chronicles Mathison’s unique opportunity to work as an English tutor for a Saudi Arabian royal family. Mathison is the only author to write about the personal lives of Saudi royalty and women from personal experience. Her follow-up book, “Creating Shamsiyah,” tells of Mathison’s bond with Princess Madawi and their mission to bring new ways of thought to Muslim women. The books are available in hardcopy and Kindle ebook from Amazon. For more information, visit www.professortimmy.org and www.tlmccown.com.